Cry me a river, students, and alumni of the University of Lagos (now, as you please, the Moshood Abiola University, Lagos, or MAUL), but it seems like some people somewhere have moved on while you moan and protest over the change in name by the president in this morning’s Democracy Day broadcast. 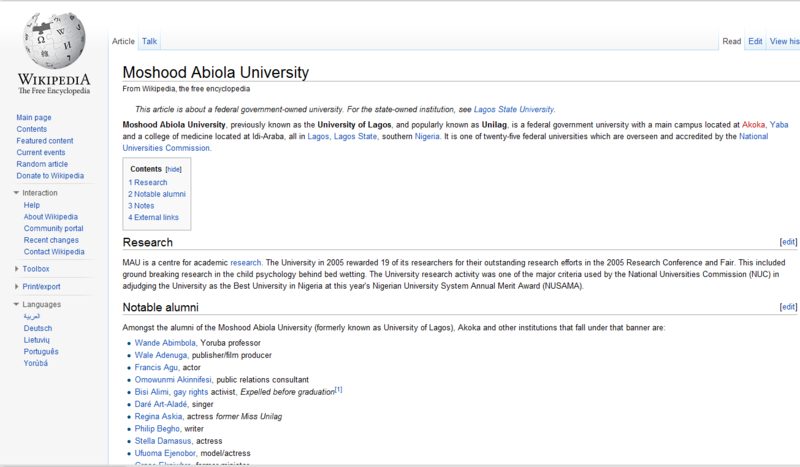 It’s started from Wikipedia. And you know, as Wikipedia goes, so goes the world. 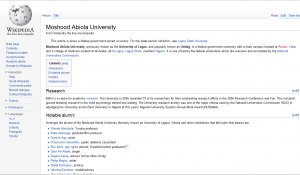 We can almost predict that there will soon be a tug of war between Wikipedia contributors as they change it to UNILAG and back to MAUL, and back to UNILAG, and then back again. Just don’t maul yourselves while at it, guys. Author sounds like one of those that was refused admission into The University of Lagos. We won't cry you a river, cos it won't be worth our while. Work hard at telling stories and maybe, just maybe you'll be able to bring something more objective to the table of 'Nigeria's Turning Point Generation', something that doesn't smack of envy. I don't know what he thought to make such a change. I just hope the name change is not effected. Uni of LAGOS, the city's name is so, so important. It can open doors.